Rainforest Bed & Breakfast is a hotel, hostel with home-stay concept incorporated with others service facilities such as travel office, restaurant, bar, mini market etc. in a 6 storey building in the heart of Kuala Lumpur Golden Triangle. Much effort has been invested in the open-plan Malay design (plus welcoming greenery outside). New management has breathed fresh life into what was already a popular, quiet and verdant oasis in KL’s shopping precinct. Lustrous wood panelling, textured white paint and an eclectic smattering of crafts (everything from petite Chinese maiden statues to oversized cuckoo clocks) give the Rainforest Bed & Breakfast its appeal. The dark wood of the rooms is both classy and cooling (helped by air-con), and even the two windowless rooms feel deceptively spacious thanks to wall-to-ceiling wardrobe mirrors. The communal bathroom in Rainforest Bed & Breakfast is like a portal to a five-star ensuite (all marble and muted lighting). The streetside communal area is set back into the shady greenery, and it’s where you’ll find the Internet access. The third-level seating area has wide-open, greenery-fringed windows to let any breeze though; the perfect place to enjoy the complementary breakfast. 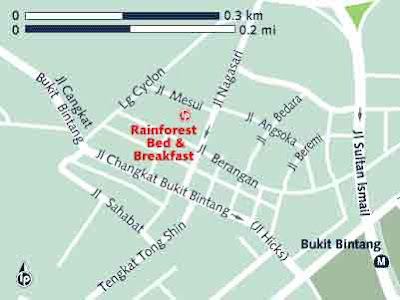 Tip: : Rainforest Bed & Breakfast did not seem to be well known by taxi drivers. Ask the driver to drop you off at the Istana Hotel and then walk a few blocks from there. When you contact Rainforest B&B, remember to mention Travel Malaysia Guide. Hereâ€™s why. Meaning to be helpful, I have two comments about Malaysia Travel Guide’s information concerning Rainforest B&B. First, the email address given is wrong. It should be rainforestkl@hotmail.com, not rainforestkl@yahoo.com. Second, it would be helpful if the country code and, more particularly, the area code were included as part of the telephone number. Please contact me as I will like to enquire rate for 21March, 01 night stay at Rainforest KL.. Many thanks.. Upon check in- 2pm, August 17’2009 to RAIN FOREST BED & BREAKFAST, KL- MALAYSIA. Front Desk A (FD-A) told me that dome sharing room are “FULL” : ” NOT AVALABLE ” . Single room for Rm 105.00 nett is available. Due to long stay of 10 days , I’ve prefer of dome sharing room for only Rm 35.00.After 20 minute FD-A mention that dome are available now?! But they are only CASH term; I need to pay daily deposit of Rm 35.00. When I step in to dome that is 2 available beds?! On 1pm,August 18′- I come down to front desk to paid a deposit but no invoice has issued by FD-B. I had confirmed with FD-B that I’ll check out a week from now- August 25’2009. FD-B confirmed told me that ” OKAY, NO PROBLEMS ” than deposit RM 35.00 I’ve to pay daily as FD-A and FD-B are agreed. ” NO, my Boss ask u to leave because u didn’t pay till August 25’2009?! “ NO, but U didn’t pay! “ NO, My BOSS want U to leave now! and he chase me away and pack up my stuffs and leave asap. I was really frustrated as it was not convenient to move. When I come down to FD no one was there, I’ve step in to dining hall, a lady officer mention that FD no record that I’ll check out by August 25′.I than repeatedly asked to speak to the hotel FD-B that had told me. After 45minute going through 3 level of management are repeatedly asking mention that “NO”. Finally the Manager, I was explained again who I had talked to and what he had told me. She has offered to upgrade me to single room but Rm 100.00 per night: they can switch me to others room as I need to pay another 20US extra daily. FD- B step in to the counter and I mention that why he not RSVP till August 25′ and why he lying to about what I had been told. He just walks away with bad attitude. Finally, by this time I was extremely upset…. I just decided not to continue my stay at RAIN FOREST. I CANNOT recommend that anyone stay here because of incredibly poor way I was treated by the hotel management. Travelers: Knowledge and expertise with other travelers in order to help them make informed decisions when selecting hotels for their next trip.